May was a quite month. It was just AT&T who paid me their dividends, but it sure is a nice amount. AT&T's yield is amongst the highest dividend yielding Aristocrats with their amazing 5.43%. I'm still very happy to have them in my portfolio. 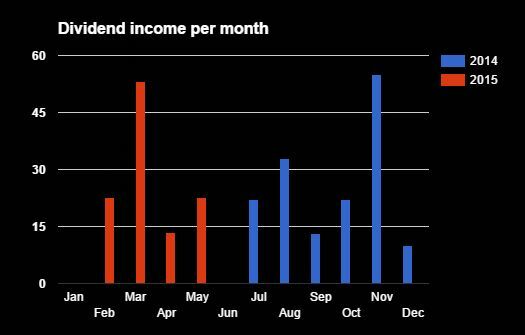 As we are closing the first half of 2015 in just about a month, it will be tough to reach my $300 annual dividend goal, but I'm still positive. We have to have confidence in the snowball to grow fast enough! I was just wondering, you have PG and OHI in your portfolio? But apparently they are bought after ex-dividend date? 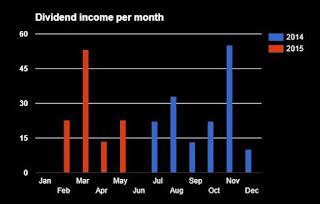 In that case they will boost your August dividends nicely compared to May. I'm looking forward to June and August especially, because these are the first months where I am able to compare this year results with last year results! Congrats on another month! T is a really good dividend paying stock, best of luck with it. Nice recent buys too with PG and OHI! All solid companies. Thanks! All I did was waking up in the morning..
Gotta love free money right? Gotta love those T dividends. That initial high yield can really get that compounding snowball rolling. I would love to add more to my T position, but as always, new funds are limited. AT&T is a great company to hold - they remain competitive and have one of the best reputations in the market. I look forward to reading your OHI review - alot of the div community seems to really like that stock so will need look long and hard at adding it soon as well. All the numbers on OHI are looking very good! Just didn't have the time to create the blogpost yet. Will do so asap! Thanks for your support and good luck on your own journey!